Aiding in funding for specialized secondary prosthetics. Thank you again for all you have done to support the Tom Perkins Legacy Foundation and our mission to help others Live Life Fully by providing annual grants to purchase a secondary prosthesis. Your belief in us, and in the TPLF goal, has been incredible and warms our hearts beyond what you can imagine, but more importantly, has made a real difference in another individual’s life – that of triathlete, Kim Yu! Those of you who met Kim at this year’s dinner, those of you who already knew Kim, or may have learned about him from our web posts, the abc7 news clip, or his photo in the dealership – all now know how much your generosity has helped him, how much he appreciates this opportunity and that he has already enjoyed real success with the running leg TPLF purchased for him, less than one year after our first fundraising event. We dreamt, we prayed and we worked together to make something really great happen, together – with your love, your support and your donations. We’re thrilled with the results of this year’s fundraising campaign. Many of you have generously donated through the website and mail throughout the year. Many of you provided us with absolutely incredible auction items and prizes that allowed us to raise even more money through raffle ticket sales. Many of you bought ride and event tickets and joined us at Don Ramon’s in celebrating Tom’s memory and our first recipient. And many of you decreased or eliminated your costs in the goods and services we needed to host this year’s event. Through all of those efforts, together, in 2017 we have raised over $29,000 which will allow us to award another TPLF Grant in Tom’s honor. Thank you again for everything you’ve done to support our family, our TPLF Team, our 2016 Grant Recipient and the future winner of our 2017 Grant. We know Tom is smiling down on all of us and is so happy to see his spirit for giving living on in all of you. TPLF is in the news! 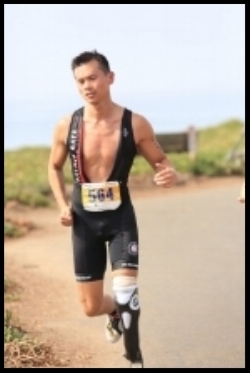 Thank you to ABC 7 Bay Area for helping us spread our message, and for showcasing Kim receive his new running leg! We couldn't have asked for a better TPLF ambassador and Grant Recipient than Kim Yu. Kim was selected for his personal story, & for the warmth & humility that came across so clearly when we met him. Kim's new running leg was purchased with our first grant, possible through your donations, and he is already supporting those who may follow him. Kim, welcome to the TPLF Family, and we look forward to supporting you in all you accomplish with your new leg.